Find the perfect card from our exclusive range of illustrated designs. 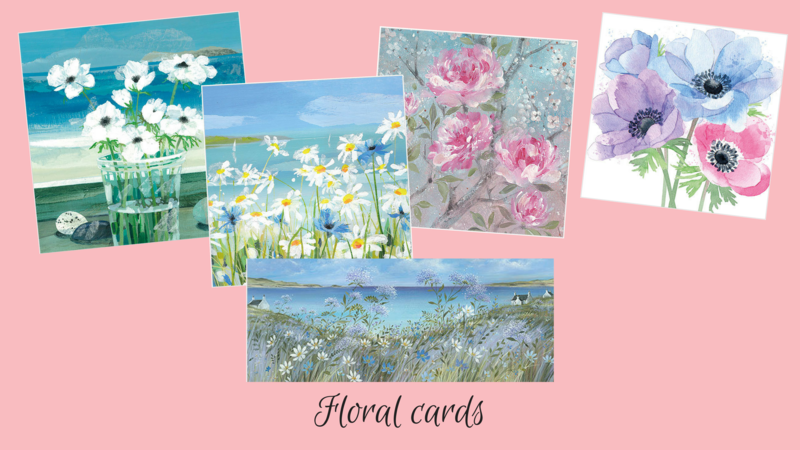 With plenty of cards to choose from, including blank floral greeting cards and new designs added regularly. The card you need is right here, whatever the occasion. If you like your sympathy cards to say something on the front then we have some great ones to choose from. If you think a floral illustration does the job just as well then take a look at the floral range. We don’t just have cards. We also have some fabulous gift wrap and gardening themed stationery too. Are you looking for pretty floral paper, something garden related or something colourful. If you need a set of notecards for yourself or to drop a line to a friend, or to make notes or shopping lists, then we have note cards and jotter pads for you. If you think I’ve missed something in this selection please leave a comment so I can add it in, thank you. If you’d like a mixed pack of cards then you can get on in my shop. I’ll email you to ask what cards you’d like in your pack. While everyone seems to hate writing them, we all know it is important to say ‘Thank you’ after Christmas. After all it’s the least you can do when someone has taken the time to choose, wrap and send a present. So here are some Christmas note cards so delightful that they make the job a little more enjoyable. 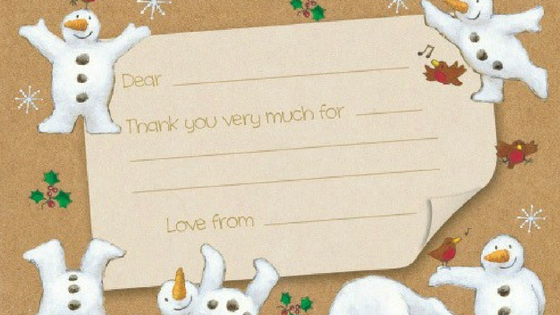 Our snowmen Christmas design has been popular every year we’ve had it and not surprisingly these Snowmen Christmas thank you note cards are our bestselling note card and envelope sets this Christmas. In fact they were so popular that they have now sadly sold out! However, the next favourite designs, our Christmas Trees are still available. These would make lovely thank you note cards or just nice cards to put a few catch up sentences on to go in with a Christmas card. Our Rudolph note card packs are still available too and I do think these are very cute though they could be used by any age. If you prefer paper to note cards then you will love these snowmen notepaper and envelope sets. 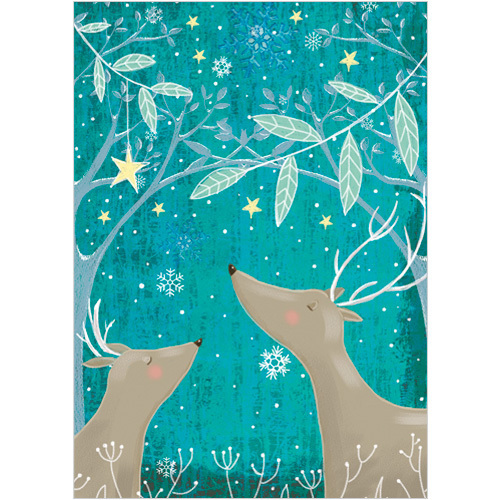 As well as note card and envelope sets we also have charity Christmas cards. All our Christmas cards support various charities via the Phoenix International Charity. This includes my own nominated local charity, Hebrides Alpha Supported Housing here in the Outer Hebrides. Our luxury, exclusive cards are available for sale via my online shop. Have you seen our traditional advent calendars? 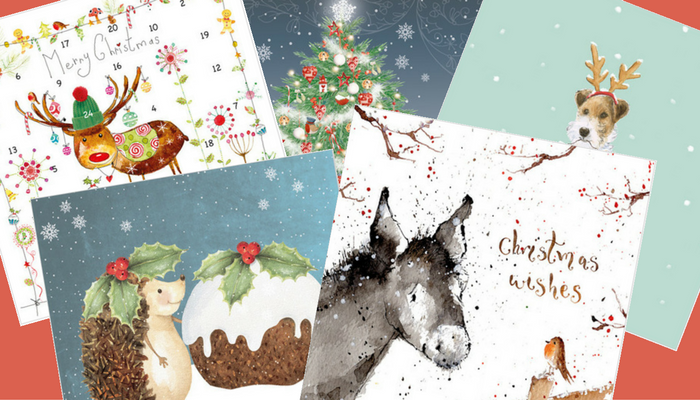 Our top charity bestselling Christmas cards in October, so far are My Christmas Friend, Little Donkey and Snowman and Robin. All our Christmas cards support various charities via the Phoenix International Charity. Our cards support three main charities; Macmillan Cancer Support, Cancer Research and Together for Short Lives. Flamingo Paperie Partners nominate all the other charities. If you’d like to see your charity nominated then all you need to do is a fundraising event with me. Our luxury, exclusive bestselling Christmas cards are for sale via my online shop. Have you seen our traditional advent calendars? 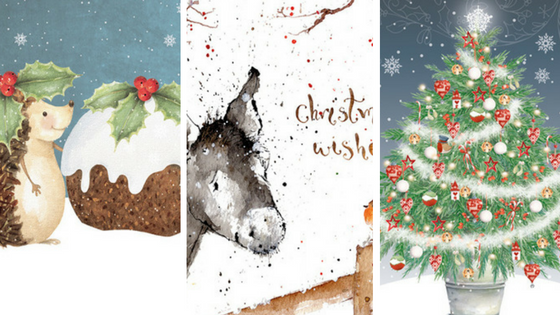 Our advent calendar cards are also charity cards! My Elf on the shelf has been busy. “Merry Christmas bunting” from Phoenix Trading. This Christmas bunting makes an impressive addition to your Christmas decorations. With 20 pieces and 4 m ribbon you can decide where to put the stockings, Santa and snowman. You can choose whether to hang in a single line, or split as shown above. If you’re stuck for Elf on the Shelf ideas than you these anagrams will help you to fill a few days of mischief. You can find many more anagrams of Merry Christmas online, a simple search will bring up a range of pages with ideas. These were my elf on the shelf’s favourite ones. And if you like my elf you can find more like him at Daisyfelts. I think he’s rather cheeky but friendly looking. Phoenix Trading closed down in August 2017. From its ashes we have a new company called Flamingo Paperie. You can view and buy the new stock on my website here. My Phoenix Trading review still stands but if you’re more interested in what’s happening now in Flamingo then I’ve put together some Frequently Asked Questions or you might like to read my review my first 6 months with Flamingo. Alternatively please contact me for more information. I’ve added a quick note at the end with my personal opinion about ‘what went wrong’ with Phoenix Trading and what will be different about the new company. If you want to join my new team now let me know here. If you want to join my new customer loyalty programme you can do that here. So you’ve heard of Phoenix Trading, you love their products and you want to know what’s happened to the company? In this blog post I reveal my experience of Phoenix Trading. What I expected from it and what I discovered. Here is my Phoenix Trading review. I became a Phoenix Trader by ‘accident’! What is it about Phoenix that attracted your attention? Did you find their cards were unlike any you see in the shops and better value? Had you received a present gift wrapped with roll wrap that looked better quality and prettier than any you had seen before? This is what most people say. Well for me it was the bookmarks! 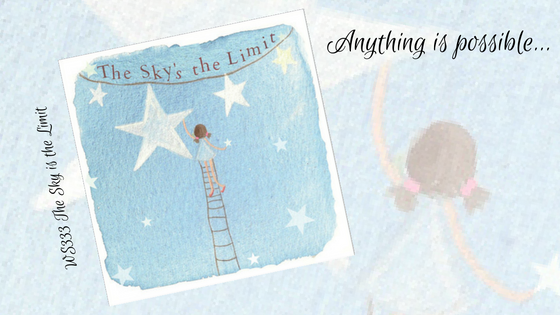 While selling children’s books, I thought the bookmarks would compliment my stock…gradually I fell hook, line and sinker for their entire range of cards, stationery and other gifts. Have you wondered if it would be worth being a Phoenix Trader just to get your hands on some cards, gift wrap and stationery that you love? I fell in love with the children’s range as I had young children. It was worth being a Phoenix Trader just for the birthday and Christmas cards I was going to use myself. If you are worried that there will be lots of sales and recruitment targets, there aren’t. In all the time I’ve been doing Phoenix no one has pressured me to sell a certain amount or to recruit people. I hadn’t intended to build a business from Phoenix but when I took a closer look at the commission package that Phoenix offer I realised that building a team and getting to the level of business bonuses was entirely doable. It wasn’t a requirement, no one would try and make me do it but it looked achievable. So if you are looking for a business, not just some free cards for yourself, there is that option too. Do I need team members to make money? There are two ways you can earn money with Phoenix; profit from sales and commission from the volume of sales your team do. You don’t have to do both it’s your choice and there are no targets for either. You decide what you want. I wanted an income from it! Sales profit is simple as you get 30% profit on everything you sell. Furthermore there is more than that on greeting cards when people don’t take advantage of their 20% discount by buying 10 or more assorted cards at a time. I think that’s a pretty good profit margin for a direct sales company (and of course it means 30% discount on anything you use!). Minimum of 5% commission on team sales – but how do you get a team? In the first few months after I started I was busy trying to work out how to ask people to join my team and the fear that goes with not knowing how to start that conversation when people started asking me! I realised it wasn’t about trying to convince all my friends and family to join my business but about listening to what customers were saying and picking up on the cues to let them know ‘you can do this too if you want’. I now have a team of Phoenix Traders across the UK and in Australia. What’s the company support like? You don’t want to be stuck on your own, not knowing what to do when your starter pack arrives. On the other hand you probably don’t want to be bombarded by emails and phonecalls from your team leader either. I’ve found the support level to be just right. My team leader calls me when I want her to. There are Facebook groups to share ideas and encouragement. There will be team meetings (usually involving cake!) near you that you can choose to attend if you wish. I do not get any pressure, just support. I don’t get hassled by phone calls or emails telling me I’ve not done this or that. However I do get constant recognition when I reach a milestone, which I love. It’s up to me to ask for input from others, it isn’t forced upon me and that’s the way I like it. I think it also makes for a better business to be honest as it’s then your responsibility. What has really impressed me is how Phoenix Traders support each other across teams. This is something I feel very strongly about. If one grows we all grow as the ‘brand’ grows. I have received multiple nominations for the past two years for supporting other Traders outside my team. It’s this spirit of support across Phoenix which I think is somewhat unique to companies like us. There has to be some negative in my Phoenix Trading review surely? The ethos of Phoenix is about having an ethical business with beautiful artwork that makes people smile. We send cards and we sell cards. We wrap presents in the best wrapping paper I’ve ever used. So we aren’t as hot on social media but I’ve seen improvements since I joined. When you show your starter pack of cards to your friends, colleagues, family the chances are they will ooh and ahh over the quality of the illustrations and product. They will see how fabulous your products are much more by physically holding them than from your Facebook page, or from a text message. Showing your cards to people is how you build your business and your personal ‘brand’. You can of course sell online too through a custom made website. Start from just £35, which includes 10 brochures to start collecting orders and 45 cards to sell immediately. Potential sales value of £70. No one sets any targets except you. I have never felt under pressure to achieve any level of sales, recruits, bonuses or anything. We all know someone with a birthday! You will use the cards yourself. In fact the hardest bit might be selling them and not sending them all yourself! Most friendly company I have ever worked amongst. You will meet people you wouldn’t have met otherwise and make great friends, if you want to. What’s the worst that can happen? You get left with a few fabulous cards that didn’t cost you much that you can use yourself. If you’re still reading this far then you may well be asking what went wrong? Why did Phoenix Trading close? What will be different about Flamingo Paperie, given the involvement of some of the same management? These comments, like all the others in this article, are just my personal opinion based on what I know. There is probably a lot I don’t know. What went wrong with Phoenix Trading? In my opinion there were 2 major things that went wrong, trying to expand in to the USA and warehousing issues. Expansion in to the USA – didn’t make money. Lost money and cost the company a lot of its reserves. Phoenix management are not the sort of people to give up easily and probably could have pulled out of USA sooner than they did but isn’t hindsight wonderful? It’s easy to throw that judgement in now knowing that the idea wasn’t profitable but at the time it would have been easy to persevere. After all it takes time to build a business right? Warehousing – because we love our products so much it’s very difficult to pulp them! Phoenix rarely pulped discontinued lines. Phoenix offered sale items to Traders. However, this had the knock on effect of leaving Traders with lots of stock to sell that was no longer in the catalogues. Personally I think we should offer sales and special offers direct to customers. I also think we should ultimately pulp discontinued lines. This would have saved warehouse costs and kept the business fresher. This will now be happening in Flamingo when you join the Flamingo Customer Club. I have a few other ideas about things that could have been done differently too but these two issues above would have made a big difference. So what will be new with Flamingo Paperie? Well we aren’t trying to expand in to any other countries for a while! We’ll be outsourcing our warehousing, which should make it financially more efficient. We are introducing a customer loyalty programme. This is going to be fantastic for you if you’re a customer! You will get direct access to special offers and discounts and have the chance to buy stock that is due to be discontinued before it goes to pulp. We have a new director called Stuart Millar. I know Stuart personally. He has even taken time to come and visit my small team in the Outer Hebrides. Stuart has been a Phoenix Trader for years and he’s a listener. I’m pretty much a nobody in the whole scheme of things but Stuart has had phonecalls and Skype calls with me and taken time to listen as well as encourage and develop my team. Without going in to too much detail of the previous commission structure, Stuart has done this despite the fact that he doesn’t earn commission directly from my sales. Having Stuart on board brings direct Trading experience to the table. It brings someone who was very much in touch with all activity-levels of the previous business. And therefore brings a greater understanding of what Traders need as well his own business and customer relations experience and knowledge. Flamingo Paperie will be a much more enhanced company built on experience, lessons learnt and listening to what all parties are saying. Like most direct sales, network marketing businesses Phoenix Trading is flexible so you make it work to suit you. Therefore, another person’s Phoenix Trading review might be totally different. I hope you’ve found my Phoenix Trading review helpful. You could leave a comment telling me what you thought about Phoenix Trading. Perhaps you’re thinking about joining the new venture, what do you like about the idea, what are you not sure about? Were you a Trader, feel free to tell us what you loved about it. Or were you a happy Phoenix customer – what made us different to other card outlets? What’s your Phoenix Trading review? You know Christmas isn’t far away when it’s time to start opening your advent calendar. I remember every advent calendar I had when I was little. They were all traditional advent calendars with 24 little doors to open. Even if I got a new one the next year I would still reuse the old one pushing the doors shut as tightly as I could so I could reopen them again. My children love chocolate but when it comes to advent calendars the delight and wonder of the traditional advent calendar is what they ask for. If you’re looking for something more traditional this Christmas season then here are some of the best traditional advent calendars you will find. Flamingo Paperie (from the people who brought you Phoenix Trading) have been producing well-known, beautifully illustrated, traditional advent calendars for over 20 years now. With either 24 doors to open or 24 pieces to press out and slot in or stand up, these calendars will stay in the memories for years to come. All printed in the UK and beautifully illustrated. 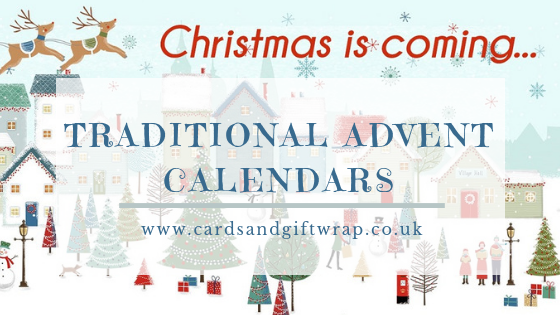 Whether you love Nativity themed, Santa or just Christmassy there are traditional advent calendars for everyone. The Nativity Stable, with both slot in and stand up pieces, illustrated by Kate Garrett is our current bestseller. This is a perfect advent for classrooms, Sunday School or at home. Ski Resort, with slot in pieces and illustrated by Julia Rigby. Christmas Ark, with 24 slot in pieces, illustrated by Julia Rigby. Tower of London, with a mixture of slot in pieces and doors to open, illustrated by Amanda Loverseed. Winter Village, with 24 slot in pieces, illustrated by Sue James. The Reindeer Stables, with 24 slot in pieces and illustrated by Amanda Loverseed is our second bestselling advent calendar. Of course you’ll know all the reindeer names but in case you forget one, they’re on each of the stable doors! If you’d like to see the Winter Village unfold day by day then take a look at my video of the advent calendar being built. The latest designs are available online in my Flamingo Shop now. Click here or click on an image to go straight to that calendar. Alternatively keep reading to see some well loved old favourites, available while stocks last here, at Cards and Gift Wrap. Snowy Village, 24 houses to build and place round the village. Elegantly illustrated by Sally Swannell. Christmas Tree, 24 slot in decorations, Illustrated by Amanda Loverseed. Bethlehem, with 24 slot in pieces and illustrated by Sarah Summers and Nativity with 24 doors to open in a 3D display, illustrated by Anna Cattermole are both exquisitely illustrated advent calendars depicting the story of Jesus’ birth. If you want something with a Santa theme then the following advent calendars all have some aspect of Santa’s part in the big day. Santa’s House, 24 pieces to slot in, illustrated by Karen Tye Bentley. It’s Christmas, with 24 slot in pieces and illustrated by Karen Tye Bentley. Santa’s Workshop, 24 slot in pieces and illustrated by Laura Stone. Map of the North Lands, 24 slot in pieces, and illustrated by Amanda Loverseed. Santa’s Room, 24 pieces to slot in, illustrated by Amanda Loverseed. No Christmas would be complete without a Gingerbread House or a Pantomime (Oh no it wouldn’t!). Gingerbread House, 24 doors to open in a 3D scene, illustrated by Louise Angelicas. Christmas Pantomime, 24 doors to open in a 3D scene, illustrated by Kate Gunn. If you love the vintage Christmas look then the 3D advent calendars with 24 windows to open each day will give an almost Victorian style to your decor. Department Store and Christmas Bakery both illustrated by Amanda Loverseed. If you like these then you’ll also love the traditional advent calendar cards. Perfect for popping in the post and like all our Christmas cards they are charity cards too. Join my customer club to keep up to date with new releases and special offers.